Throughout this book, I share success principles and life lessons that changed the way I thought and lived. I’ll reveal some important lessons Mary Kay Ash taught me about life as well as business. My motivation for writing this book was not to highlight what I earned, but what I learned. In many ways, Mary Kay Inc.’s theme song, “It’s Not Where You Start, It’s Where You Finish,” epitomizes my life story. Do you have a dream that you imagine yourself achieving? Sometimes, our largest dreams can get away from us, and months, even years, slip by and we wonder if that dream will ever materialize. In Becoming Visible, you will discover secrets to releasing your heart to others, be true to yourself, and walk towards your dreams with confidence and security. At the end of the journey, you will find hope, love, self-acceptance, and worth. In “Becoming Visible”, Sue Z. McGray opens her heart and her life experiences to us. Written in an easy-flowing, conversational tone, it doesn’t take long for a reader to get to know Sue as she bravely shares a behind the scenes tour of her life. As a pastor, the element I appreciate most about this book is how Sue gives easy to digest, practical lessons to consider along the way. For any woman wanting to break free and to achieve success, “Becoming Visible” will help! Becoming Visible is for every woman that ever struggled with fear, insecurity and finding her voice. Author Sue McGray shares from her personal experience how she broke out of her personal prison to become a vibrant person, author, and leader. Sue’s story and book resonated with our viewers. Author Messy to Meaningful & two other books. Sue McGray’s book Becoming Visible will encourage and inspire you to follow your dreams regardless of your circumstances. This book provides the reader a rare behind the scenes look into the journey of a successful female entrepreneur. The highs and lows are compelling as she takes the reader deep within her most private experiences exposing her weaknesses, fears, vulnerabilities, and successes. It is a common misconception that successful people don’t encounter struggles or obstacles the average, everyday person experiences. Sue debunks this misconception by detailing her own personal struggles in areas such as; negative thinking and self-doubt, marriage problems, financial struggles and the deep, long-lasting pain from losing a loved one. Yet through it all, Sue becomes visible and achieves her greatest professional goal; becoming a Mary Kay Independent National Sales Director. This book will inspire you to stop making excuses and instead, make your dreams come true. Thank you, Sue, for sharing your journey with us and for reminding us that we can be anything we choose to be if we don’t give up on ourselves. I thoroughly enjoyed your book! Author of “Cally and Me” (available this fall). creator of the Infinite Success System. Sue is very transparent and raw with her story. In Becoming Visible, you will see what a huge, beautiful heart Sue has for others. Since 1988, I have had the privilege to be mentored by this amazing woman. No matter who you are or where you are in your life, Sue has time for you and will pour belief into you. During the time she was going through her abusive marriage, she never stopped pouring belief into others. She never complained or showed herself to be a victim. Instead, she chose to be victorious. She chose to take herself out of a toxic relationship and move forward with her life. Sue has so much trust and faith in God and allowed that to be her guiding light through the trials of her life. As you read her book, you will be inspired to be victorious. Just as Sue allowed God to use her as a light for others, you, too, will be inspired to do the same. Sue’s book is full of inspiration, encouragement and hope; just like her life. She is open and honest about her victories, and just as open and honest about her hardships. Sue always helped others become successful on her journey to success. Her determination and work ethic challenge me. Becoming Visible reminds you and me to be who God created us to be-and to enjoy the journey! You will be blessed as much as I was by reading this inspiring book, and you will realize that you too are beautifully visible! 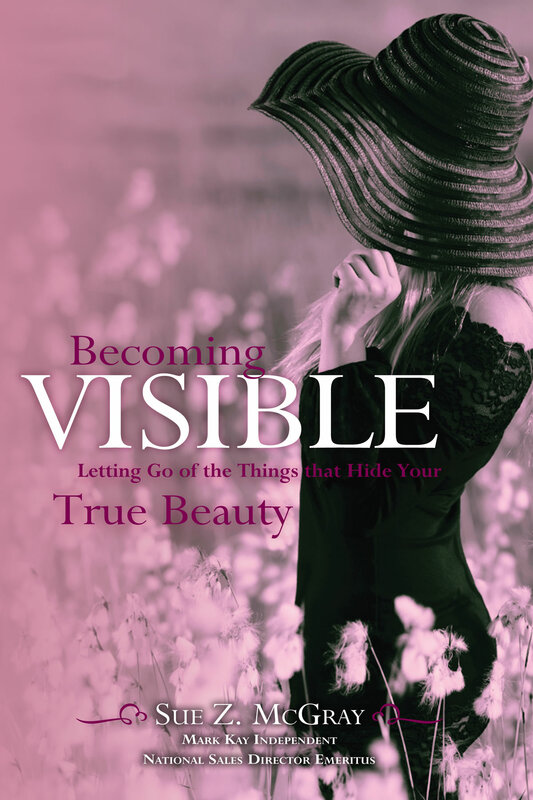 Becoming Visible – Letting go of the things that hide your true beauty! One of the best books I have read! I couldn’t put it down! It is so captivating, motivating and full of encouragement! Sue is very transparent of her struggles and what held her back during her younger years, which caused her to live below her God given talents and purpose. By connecting to the right people, her life was transformed one day at a day. If you are looking for a great and encouraging book to add to your library, look no further. I absolutely loved it and highly recommend it! You will NOT be disappointed! an outreach ministry in Nigeria and Montgomery Al. It’s with earned respect and overflowing joy, I recommend Sue McGray’s book “Becoming Visible. I have had the pleasure of witnessing Sue’s authentic voice and courage and I’ve had a front row seat watching her succeed as God has intended! Sue shares how to Let go of the things that hide our true beauty. This is a must read. If you are anything like me, this will be one of those books you won’t be able to put down. Sue McGray has packed her book, Becoming Visible – Letting go of the Things that Hide Your True Beauty with so many emotions that you truly feel you were right there with her throughout this amazing journey. She inspires, she motivates, and she helps all of us realize we can make a difference in our lives and those lives we encounter. Her book, Becoming Visible, showed me her true beauty and her true calling, to inspire others and to make a difference in the lives of as many people she encounters as possible. She clearly has done that through sharing this wonderfully written book. truly overcome and find peace if you haven’t yet with your past. Sue’s zest for life shines through on every page and her zest for life is truly contagious. I finished this book feeling energized and refocused on what I want and need to do with my life. I trust you will feel the same. That old saying that all of us have heard sums it up best. “Tough times don’t last, tough people do!” Well it is clear to me that Sue McGray is one tough woman!